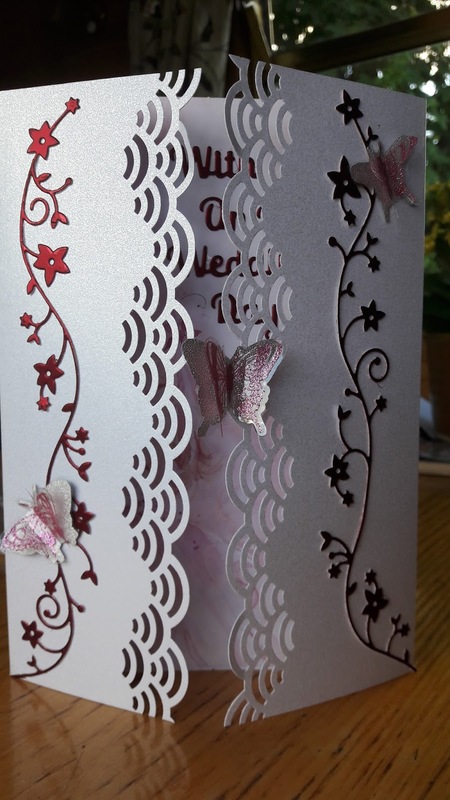 Hello lovely readers and welcome to WOYWW, or What's on my Worktop Wednesday, and for those who have no idea what I am talking about, go over to the wonderful Julia's Stamping ground. So to the business of the day. 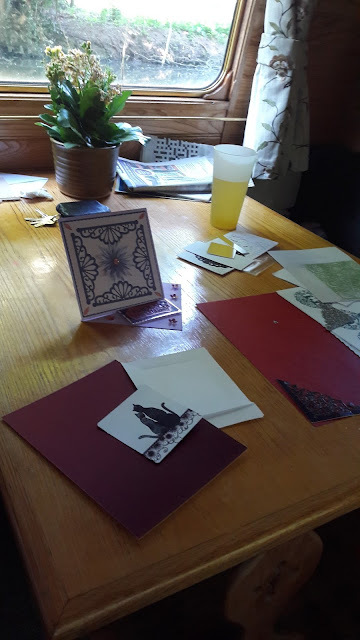 table yesterday where I was making a couple of cards. 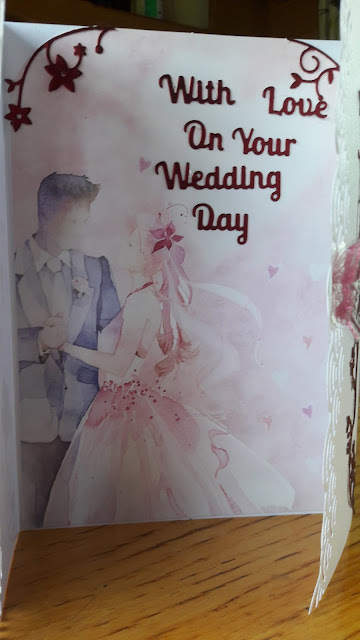 A birthday card for my niece and a wedding anniversary card for my sister. It was quite dark unfortunately, we spent the whole day moored under trees because it was so warm, which kept the temperature bearable, but meant it was not very light for making cards. Being on the boat means that I have to clear away my stuff every time we want a meal, and all my stuff is stored in two drawers and I have to get out everything to find what I need, as a result I don't manage to get much done, however I did make a wedding card last week, before we hired a car and drove all the way back to Wales for the wedding. We are moored near Roydon in Hertfordshire, which is very beautiful, and in spite of the train line being fairly close, the trees muffle the sound of the trains quite well. We are heading up to Bishop's Stortford on Thursday and then slowly back through London and then working our way north towards Cheshire. 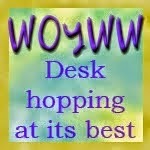 Well that's all from me for now, have a lovely WOYWW day. Morning Chris - yes - I agree with Helen and BJ - but I found you... We have both posted this morning for the first time in what seems to be ages. Gorgeous card for Helen and new hubby - and a lovely mooring yesterday. It's already cooler here this morning - and we have had thunder, lightening and torrential rain... No guarantee what else we may get!!! Have a great day. Haha, I commented on the wrong link, and didn't look at the date! No wonder it was raining! Thanks for your visit earlier, I hope to be on a narrow boat soon ... but only celebrating PJ's birthday, yet again! 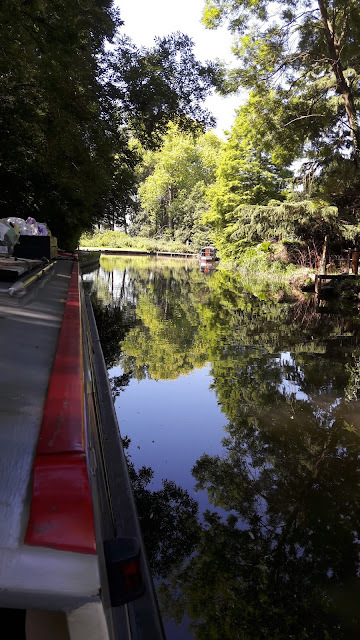 I love travelling our canals, luckily we have lots of them in and around Birmingham. Beautiful cards! Sounds like you're having a wonderful time on your trip. I bet it's very relaxing and has some great views! What a gorgeous wedding card! I hope the drive to Wales and the day was a lovely one. Your pics of the canal are lovely, I'm so sorry that I had to put the kibosh on our plans to meet up a few weeks ago. I hope you're having a lovely time, and I'm quite jealous of the London route, I believe it's lovely. Great that you manage any card making while you're away, specially as you're so good as to clear away and start again each time!